Listen in on Matthew and Susan Daimler’s dinner conversations and you might start to understand what makes the couple successful, not only as husband and wife but as co-workers. “We’re just moving back and forth between topics — some are work, some are personal, some are kids,” says Susan, A&S ’99, university trustee and senior vice president overseeing the Premier Agent business for the online real estate marketplace Zillow. Matthew, Engr ’99, vice president and general manager overseeing Zillow’s New York operations, interjects to describe a common scenario. A single conversation sometimes includes two women named Caroline: his sister and their co-worker. 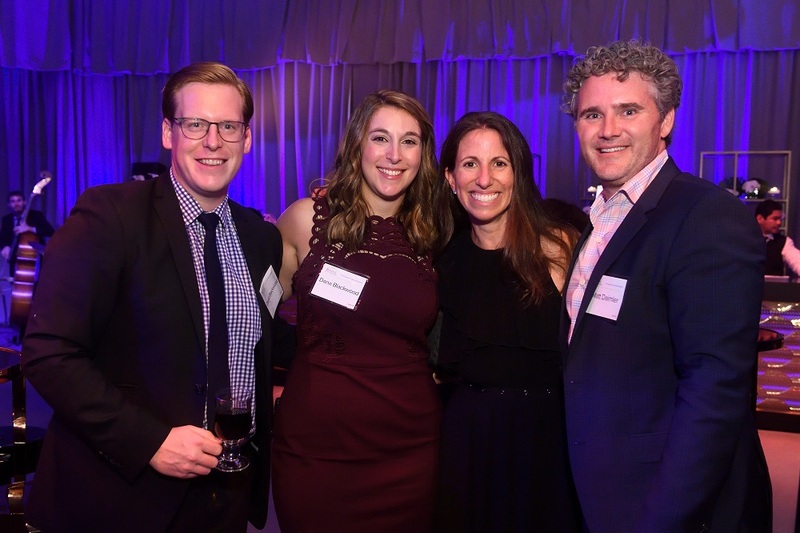 (l-r) Dave Blackwood; Dana Blackwood, MBA (Bus ’14), Engr ’10; Susan Daimler, A&S ’99; and Matthew Daimler, A&S ’99 attend the Rising to the Challenge campaign closing event in October 2018. The couple met as undergraduates at Johns Hopkins, and after graduating, they packed a U-Haul and drove 2,800 miles west to work in Silicon Valley at the height of the dot-com boom. There, they founded SeatGuru, a website that helps frequent flyers pick the best airplane seats (sold to Expedia in 2007), and Buyfolio, a web tool to help real estate brokers connect with clients (sold to Zillow in 2012). “We were pioneers and risk-takers, and I think that was sort of enabled by not having student loan debt and being free to explore a new world,” Matthew says. That’s part of the reason the couple says they give to Johns Hopkins. About 10 years ago, they established the Susan and Matthew Daimler Scholarship, followed by two more scholarships in each of their parents’ names — their way of thanking their parents for the gift of graduating debt-free. So what’s next for the Daimlers? For now, the couple says their life in Manhattan is quite full and satisfying between work and raising sons Flynn, 3, and Tuck, 1. “We haven’t come up with any products to solve the frustrations of a 1- and 3-year-old. As they continue to grow, I’m sure we’ll have more ideas,” Matthew says. This article first appeared in the Winter 2018 issue of Johns Hopkins Magazine. Interested in supporting scholarships, research, and career development opportunities for undergraduates?